Katherine relocated to Cornwall after qualifying in 2017 from Leeds Dental School. Initially completing a BSc in Biomedical Science, Katherine began her dental degree in 2012. After qualifying in 2017 Katherine took up a position at the practice as a foundation dentist for a year being mentored by practice principal Andrew. 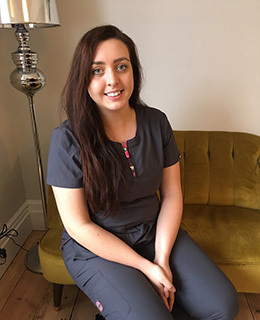 Katherine decided to stay on at the practice following successfully completing the year and now provides Facial Aesthetics and Skincare as well as enjoying general dentistry. Katherine is absolutely loving her relocation to Cornwall. When she isn’t travelling the country watching her husband playing rugby, she enjoys spending the weekends exploring the Cornish coast. Katherine makes regular trips back up to her home county of Yorkshire to visit her parents but most importantly her two dogs.